I’ve got a day of moving furniture around (yippee! I mean, really, yippee!!) planned tomorrow, and after a few more changes I hope to show you the space next week. Before I show you the fantastic blogger I’m showing off this month, I need to announce the two winners of the Vintage Poster giveaway. The lucky gals are Karen at Pine Oak Ranch (she has a grandbaby due soon!) and Amanda Smith at The Smith Family. OK, onto the fantastic blogger-o-the-month. You’re going to kinda love me/kinda hate me after reading this post, cause you’ll click over and be at Kristi’s site for a LONG TIME. Consider yourself worthless for the evening. GAH. Can you believe it? To see her process, go here. I warned you…you’ll be surfing through her site for awhile. :) Put the kids to bed, grab a drink and prepare to put a dent in the couch. Great choice this month Sarah! I LOVE her!! One of my favorites (besides YOU of course!). I had no idea Kristi was from Waco. I'm definitely going to be looking her up for a meet up sometime soon!! Thanks Sarah for having great taste. Oh my... love all this, esp her painting. Think she could sell some of those on Etsy! Ooooh can't wait to check out this blog. Thanks so much for sharing. Thank you so much for the feature, Sarah! What an honor! She is amazing with a capital "A", and I've been a fan of her blog for a while now, faithful reader here. She really is uber talented and comes up with some incredible transformations. But she had me at upholstery, specifically, diamond-tufted upholstery. You have to see her stuff to believe it! She is one of my faves too - great choice girlfriend!! And you are so good to be sharing the bloggy love!! Can't wait to envy... um I mean see - your sectional! Awed! This is one talented lady! Clearly I have been living under a rock because I haven't seen her blog before - off to check it out now! She's the first blogger I ever read and I think she's unbelievably talented. She also creates these amazing projects about twice a week...the woman seems tireless! Great choice! Kristi certainly has the decorating knack. Blue and brown make for a 'lovely to look at' home. haha you are adorable. i love how excited you are about your sofa. it's making me excited too! it reminds me of this last fall when i found the sofa of my dreams in the clearance section! i was the same way when it came. so fun! I can't wait to see your new sofa! 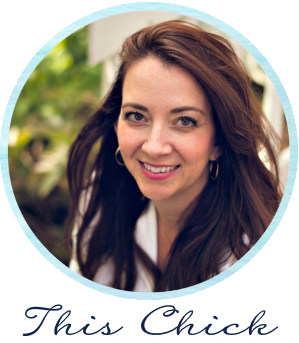 Kristi's blog is one of my favorites. That girl has serious skills. Did you see the warehouse cart style coffee table she BUILT??? It's amazing. That gumball fish tank is hysterical! What a great idea!!!!! Wow - she has some serious talent! I love seeing great DIY projects. And, as an aside- I'm an avid reader of your blog and have just started blogging myself. All the great blogs I've been following (yours included of course) are so inspiring! Please check out my site and follow if interested. LOVE THE GUMBALL TANK! SO RAD! I love the gum ball fish tank. Your photo brought back lots of memories. I used to keep tropical fish years ago. I always had two or three Betas because of their fantastic colours and they are so easy to keep. The main thing of course was to keep them from seeing each other. I used to keep them in seperate rooms. Great blog by the way. I hope you'll come by Rosa's Picks and join my give-away contest for Farnsworth Note Cards today!! It's easy, all you have to do is leave me a comment! She is fabulous - isn't she?! I already follow her blog, and get much inspiration from her. I can't wait to see who else you show off, maybe I will find some new loves! Gorgous style I must say! Love you ideas! Keeps my creative juices flowing! Wow - both of those ladies are amazing! Great job! Congratulations on your new addition to the family! (sofa, that is) I will have to check out Kristi - I think I'll schedule time on Sunday since tomorrow is MOOOVVVING day for me ~ let the DIY is my own space begin! Woo Hoo! Love Love Lurve your blog Have a lovely weekend. Thanks for sharing Kristi - very cute ideas! We used to live not far from Waco, so will check out her site! Can't wait to see which sofa you got - still the Brentwood or did you get a different one? Have a good weekend! Just went to the Ridge today. Saw those dreadful toilet paper holders. I have spent the last 2 hours on your site. Looking at all of the kitchen renovations. Beginning my own renovations tomorrow. I was thinking about taking down my own tile backsplash. Don't know if I want the challenge. I thinking of going with the glass tile that is so popular now. We'll see. Thanks for all the great ideas and help. Thanks for sharing this great info. It was really a great read.